A new school year brings anticipation, excitement, and renewal. For many teachers, the first day of school is one of their favorite days of the entire year. When the first day adrenaline begins to wear, the real school year kicks in. The year often brings various highs and lows but generally it follows a fairly consistent pattern. That pattern is displayed in the above graph. While a generalization, and therefore not perfect, much research has been developed by the New Teacher Center for this chart. 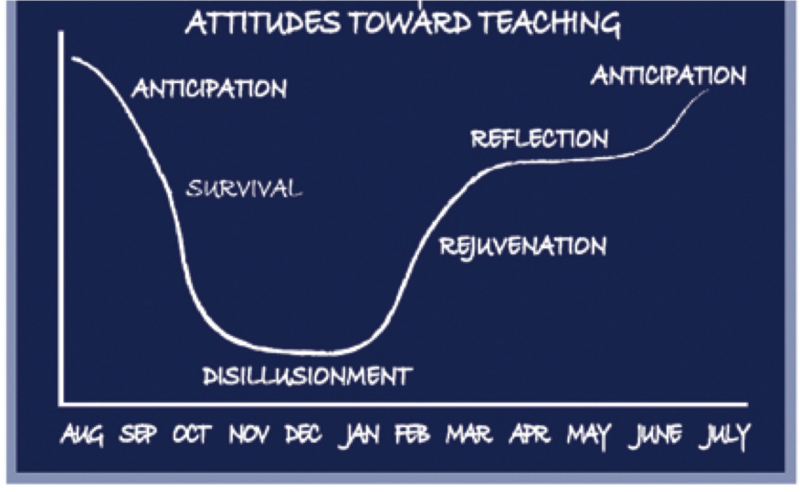 Furthermore, while the graph is intended for the use of new teachers, it can also be used as a characterization throughout all levels of teaching experience. Therefore, it is important for all teachers to be familiar with the pattern, to better prepare themselves for the year ahead. One major area that jumps out at many educators who see this graph for the first time is the drastic dip that takes place in the fall and winter months. I think this could be even more indicative in our WELS setting as we prepare for the rigors of the Christmas service. Now we don’t circulate this graph to cause depression, quite the opposite. If an educator understands that certain times of the year may be more challenging than others, they can better prepare themselves for the potential hurdles that lay ahead. I don’t think it would be too much of a stretch to assume this same pattern could apply to our students and their parents as well. Through years of experience, I have often found issues coming up in the months of January and February. Maybe some of you can attest to the same thing. So the big question, how can we better prepare ourselves? After gathering feedback from other educators, I have a few, simple ideas to help keep you on track through the highs and lows of the school year. Educator after educator stated this was the most important, I have to agree. Ultimately, He will always be there for us. He will never give us more than we can handle. 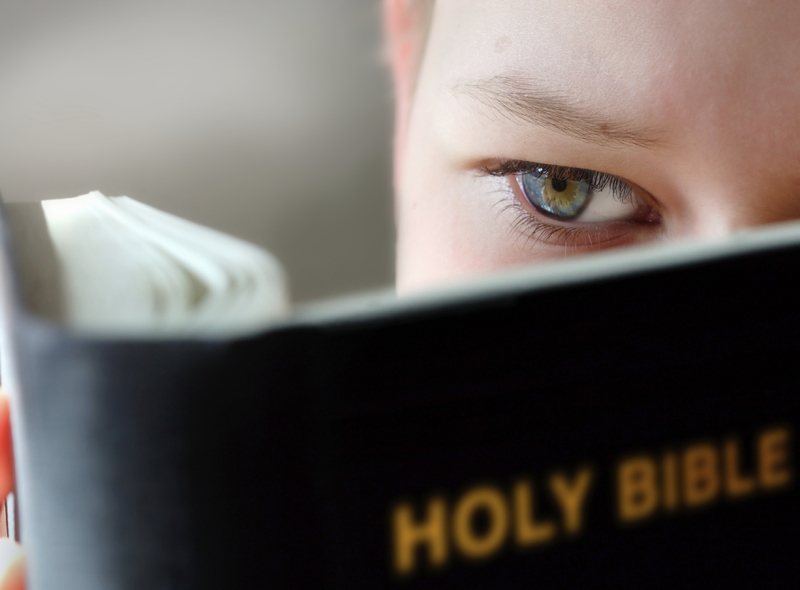 Through the work of the Holy Spirit, He has called us to the unique settings and situations in which we serve. Mr. Jerome Wolff stated that during he worst times of the year he would find himself writing his own devotions. What a wonderful idea to keep our feet firmly planted in the reassuring message of the Gospel. Several educators stated that staying healthy was near the top of their list. Getting a good amount of sleep, eating well, and exercise are all part of living a healthy lifestyle. Perhaps the bigger idea is to make sure you allow time for yourself. Educators can get so bogged down in the day to day rigors of school. Mrs. Rachel Pierson commented that it is vital to carve out a hobby outside of school. This hobby can be anything. We must always remember that we also need time to ourselves. I realize this is much easier said than done. However, big picture is the healthier we are, the healthier our class will be. In my file cabinet in the office, I literally have a “Bad Day File.” This file is there for my worst of days when I knew I blew it, or things just did not go as planned. What is this file filled with? Notes from past students, cards from family and friends, a bible verse, etc. While corny, sometimes it is great just being able to pull that out and look through those reminders when everything else seems to be going the wrong direction. Mrs. Brittany Trimmer added that it is important to keep in mind why we do what we do. At the end of the day, we have the incredible opportunity to share God’s Word with the children that He placed before us. Wow. Does it get any better than that? I would like to thank all the folks who helped out with this article by sharing their thoughts…your support is appreciated!